I want my digs to smell un-gross. Just not like "Blissful Morning Dew Drying on Glistening Grass" or "Honeysuckle Blossoms on Summer Mornings," which leaves me little choice in my hunt for fresher air. 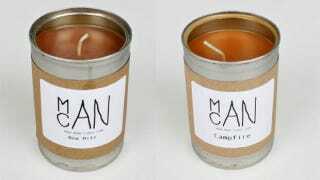 Enter Man Cans: candles for men.